Today marks our second week in our above garage home. As cooking, cleaning, organizing, and ordering products has taken precedence, my furniture building time has been spread out over weekends, plural rather than singular. However, having no tables and only one completed dining chair has made eating a little messy on our modular sofas. 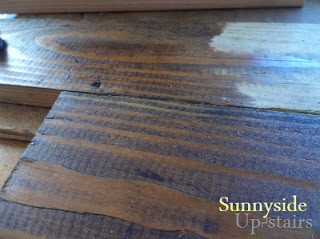 Last night, I applied the third and last coat of Wipe-On Poly to a reclaimed wood coffee table I built using "deconstruction" lumber I purchased for 20 cents a foot at Re-Use Hawaii. 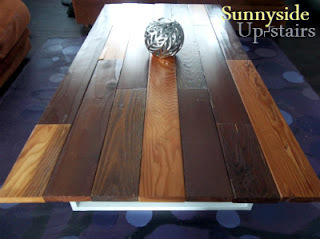 I purchased a trunk load of lumber for $17, and I used a small fraction of that lumber for this table project. 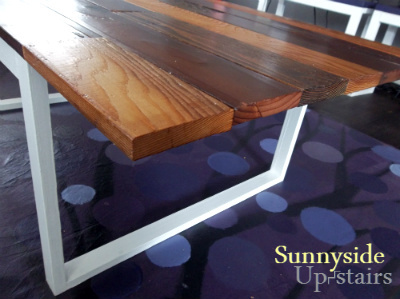 Made of entirely reclaimed lumber ($4), excluding the $1 of 5/16" dowels, this coffee table now adds a handmade, homey touch to our evolving home theater living room. $167.30 left to spend to make sofa slipcovers, pillows, and decor. 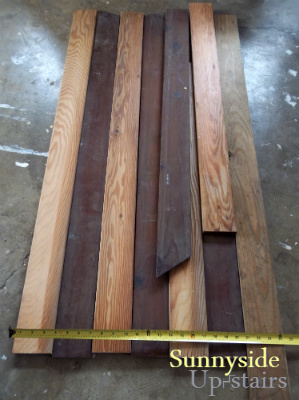 After pulling all the 1x4s, here is the remaining reclaimed lumber purchased from Re-Use Hawaii! I'm excited to find uses for these. Taking an hour to go through the stacks of varied lumber was worth it. I found some beauties, like this 1x4. Can you believe this plank cost me 80 cents? Without using a plan, I laid out the lumber I had and decided to shoot for a 4 x 3 table top, or something close to it. For this project, I let the wood "speak for itself" and designed the table based on what we had. I started by cutting off the ends of these lightweight and easy to cut purple toned 1x4s. 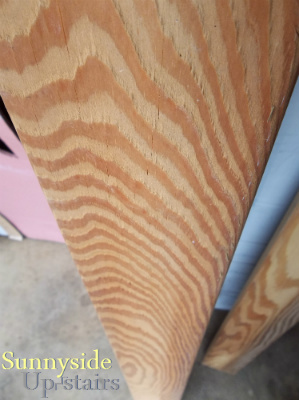 I have no idea what kind of wood this is, but I love it. 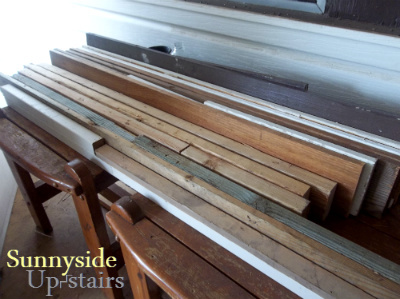 The 8 ft. of 1x4 that we already owned had an offsetting green tinged to it that competed with the orange and purple tones of the other wood, so I stained it with the same old can of Minwax Red Oak stain I used on our Herringbone Console Table Top. Since some of the wood was shorter than 4 feet, my husband thought it would be nice to have the wood mixed and staggered. After an associate at Home Depot who was a carpenter by trade, showed me photos of furniture he made using only wood dowels and wood glue for the joints, I decided to experiment with dowel joints too. 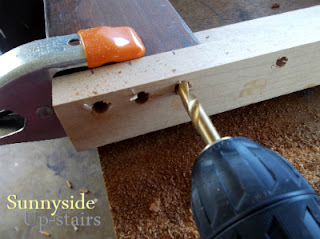 I made my own dowel jig and drilled holes in the cut ends of the lumber. 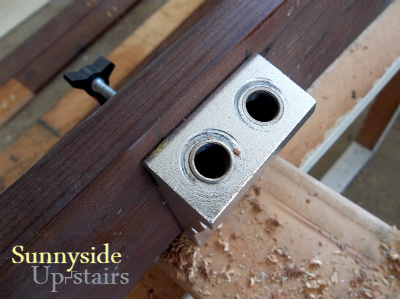 The trickiest part was ensuring that the dowel holes on each end of cut lumber lined up. I cut dowels about 1 1/2" with a backsaw, then tapped them into the holes with a rubber mallet with Titebond III. 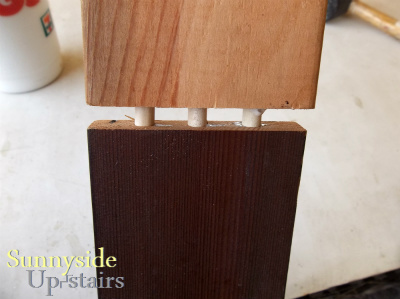 Then I lined up the dowels with the holes on the other piece of wood I wanted to join and tapped them flush together with the rubber mallet. 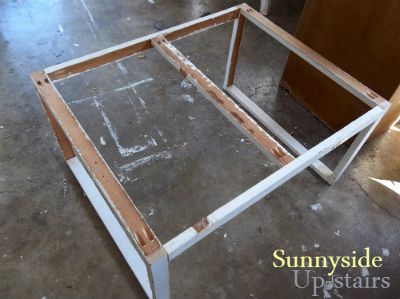 The legs and base frame of the coffee table was made with more of the scrap wood we removed from our window framing when our kitchen windows were shortened to allow for standard height cabinets. We used the rectangular leg design we used for our Scrap Wood End Tables that started our furniture kick, to echo the design. I added an additional support bar in the middle to prevent the top from sagging. 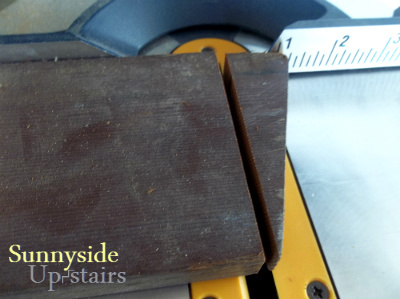 I configured the cut and dowel joined 1x4s in a pattern I found pleasing and turned the planks over. 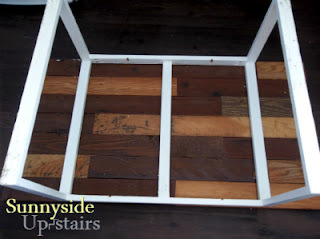 I placed the frame top side down, as if the table were flipped over, centered it, and used a green Sharpie to mark where the top supports were. 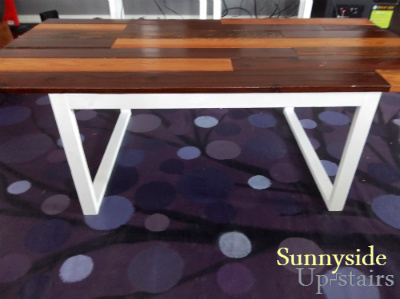 I originally thought to use only wood dowels, but I was nervous about not having all of the wood matching well enough to have a table top. After sanding and painting the frame, and sealing the top over a period of 12 hours, letting it cure all night, I finally brought up our new "old wood" table upstairs! I decided not to use breadboard ends. I love seeing the end of each plank too much! Our coffee table: $5 out of my pocket, 2 weekends of time, and one reclaimed flat surface for us to use!